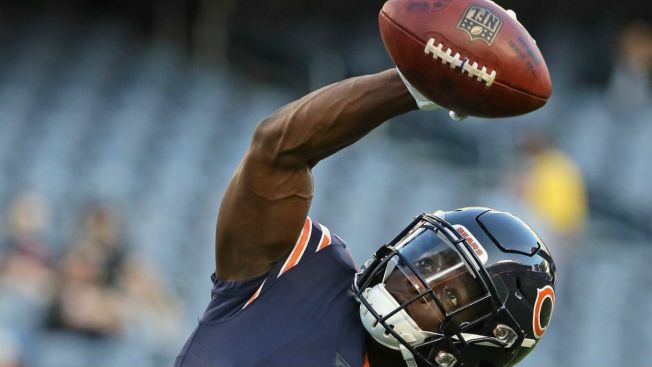 The Chicago Bears got some good news on the injury front Wednesday, as wide receiver Anthony Miller returned to the practice field at Halas Hall. Miller, who suffered a separated shoulder in the team’s Week 3 win over the Arizona Cardinals, was a full participant in the team’s Wednesday workout, according to the Bears’ first injury report of the week. Defensive back Prince Amukamara, who missed the team’s Week 4 win over Tampa Bay, was a limited participant with a hamstring issue, and offensive lineman Eric Kush was also limited with a neck ailment. The lone Bears player to miss Wednesday’s workout was Marcus Cooper Sr., who missed Week 4 with a hamstring injury. On the Dolphins’ side of the ledger, five different players missed practice, including safety TJ McDonald, defensive end Cameron Wake, and wide receiver Danny Amendola. Wide receiver DeVante Parker and offensive lineman Laremy Tunsil were limited for the Bears’ Week 6 opponent.